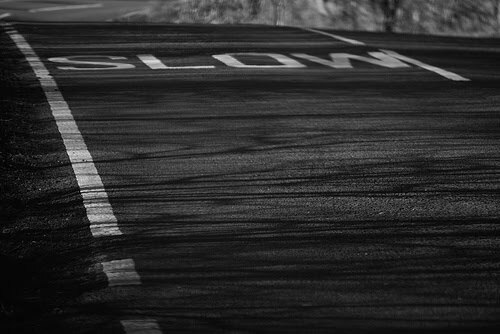 I rarely find myself in the slow lane. Literally or figuratively. My whole life I have been accused of burning the candle at both ends. A few weeks ago I had a doctors appointment. My doctor is about 35-45 minutes away (because when you have doctor that is caring, and good, and sees your whole family, and has known you since you were 18, you stick with him, no matter the drive!). 45 minutes in a moving car is enough time for PBgirl to get a good nap. It's also just a enough time to ruin the day. For her to fall asleep the last five minutes of the trip and need to be woken up, which makes her (and me) miserable. So since we had left early that day and she promptly fell asleep I pulled over into the slow lane. Made the conscious effort to go the speed limit, not constantly pass other, just drive. It was hard. I am a city driver, to this day, even in suburbia. I become inpatient, take shortcuts to avoid trains and lights. If it's not hard it's not worth doing. I wrote this in a little notebook I keep in my purse. As I sat in the parking lot waiting for her to wake up on her own. It's such a reflection of my life, especially now, in May, when I am so busy with so many different things. I'm being forced, again, to slow down against my will. My son has strep (again!) and I am sure I now have it (again!). I am scheduled to be at the airport to leave for CBC '10 at 10:30 on Thursday. this is God's way of telling me that some things need to just go undone. I am not superwomen and I cannot do it all. I also don't have to. 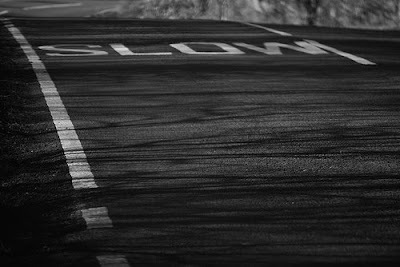 I have to remember to move over into the slow lane and just drive. God has placed in parking lots to slow down too. Stopping from SITS! In real life and on the road, I'm always zipping right along, too. Life at 80 miles per hour. But then we miss so much. I don't want to see my kids' childhoods like I see the side of the expressway -- blurry and distant.